Coincidentally three of the last four books I have read have all come from Harper Collins and they are all very New Zealand in content. Some time ago a decision was made to limit the number of titles we publish each year, in order to concentrate our resources so that each title received more marketing, publicity, design and editorial input. As a result, we have seen our average print runs increase, and by concentrating our publishing focus on those areas where we feel we can do the best job, we have been delighted to see our authors continue to raise their sales and increase their profile. While it may appear that we are publishing more titles, it is in fact more accurate to say that we are publishing our titles more successfully, as we are now publishing less titles annually than say five years ago. This paperback is one that all fisherfolk should have, on the boat and at the bach. 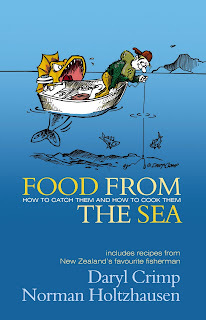 The first part of the book illustrates and describes, in alphabetical order, the huge variety of seafood caught on and around our coast starting with Albacore Tuna all the way through to Yellowfin Tuna with everything else in between from Kina and Kingfish to Trevally and Whiting. In the second part of the book we find all the recipes that come into play once you have caught your fish. And a really clever feature is that at the bottom of the page describing each fish is the name and page number for the recipe. Darryl Crimp, an irrepressible Nelson-based fisherman has the reputation of making the world’s best whitebait omelette, it must be sensational, and when not out fishing produces his own newspaper, The Fishing Paper. Norman Holtzhausen is the fishing editor of Trade-a-Boat magazine and also a keen seafood afficianado. They make a great team and I can see a lot of guys getting this book in their Christmas stocking. Later they will wonder how they ever lived without it! Continuing on the food theme here is a knockout of a hardback book with loads of recipes from the award-winning executive chef at the luxury hotel Blanket Bay Lodge in Glenorchy. Most of us will never get the chance to eat at this internationally acclaimed lodge but this book provides the opportunity to try some of Dell’s fabulous dishes. My trial dish, signature lamb with hummus, tabbouleh and sticky tamarind. Sounds a bit complicated but it isn’t and the end result, superb! Even if I say so myself. The book is divided into handy sections – soups, vegetarian dishes and salads, fish & seafood, meats, desserts and baking, brunch, and accompaniments. Dishes accompanied by superb photographs by Fredrick Larsson who surprisingly doesn’t get a mention on the cover or title page. Other features include wine recommendations, some gorgeous photographs of spectacular southern landscapes, along with personal stories about special industry personalities he has met and worked with in his culinary career. Dell, of Ngai Tahu descent, is a regular writer & food stylist for Te Karaka magazine, has represented New Zealand in various international culinary events and is actively involved in mentor ing young chefs. Married with four children he lives at Glenorchy. An attractive, appealing and useful addition to the kitchen library. Congratulations to the author, photographer and publisher. The local publishing industry can compete on any international stage when it comes to cookbooks. Pic shows Asian-inspired twice-cooked pork belly with soy caramel jus, spinach, roast pumpkin and ocean scallops which I am planning to cook this week. Each recipe has wine suggestion with it. For this pork belly dish a Central Ortago Pinot Noir is suggested "with flashes of sweet cherries and berries, and just enough acidity for the perfect balance." Derek Hansen, born in England, raised in New Zealand and now living in Australia, had an illustrious career in the advertising world before turning his hand to writing novels. His first, Lunch with the Generals, was an enormous success around the world and he has since written a further seven novel as well as three collections of short stories. This latest title set largely in the Auckland suburbs of Grey Lynn and Ponsonby in 1956 is quite different to anything he has done before as it is told in the voice of a twelve year old school boy. This a boy is exceptionally talented at writing essays and it is one of these essays in which he inadvertently reveals a wartime secret regarding the sighting of a German U Boat that provides the plot for Remember Me. This was a great read for me as I related very strongly to the mores and language of the time and came across metaphors and other expressions I hadn’t heard in years. These and the escapades the boys get up to after school, remember this is the pre-tv, pre-electronic age, gave me a real burst of nostalgia. At one stage early in the story the boys are nearly caught “raiding an orchard” and on reading this I had such powerful recollections of such experiences from my own childhood in Gisborne in the 1950’s. All these years later I live in Ponsonby and so can picture the streets and places in which Hansen sets his story. One assumes there is a fair degree of autobiography or at least memoir in the novel as the author did grow up in the same area during the 1950’s. Great cover featuring the former Ponsonby POst Office!